We specialize in high-end, gently used equestrian equipment, apparel, accessories, home décor, art, jewelry, and vintage/antique items. While we are primarily focused on English riding supply, we do carry some Western tack and offer décor for any type of horse lover. Owners, Anne and Dave Heflin, take delight in offering this venue to the equestrian community where consignors can take advantage of the opportunity to sell used equipment and apparel in a structured yet easy fashion with no up front fees and no appointments necessary. 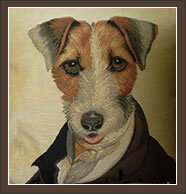 The only thing we ask is that items be CLEAN and in “VERY GOOD” to “EXCELLENT” condition. In some instances, we do consider purchasing items for resale such as liquidation situations. There is no doubt that riding is an expensive sport. Therefore, we are also thrilled to be able to provide the community with the option to purchase gently used goods at a significant cost savings. This is especially beneficial for the parents of young children just starting out or with kids quickly outgrowing those expensive riding clothes. Popular name brands are available within the store. While we are primarily consignment, we also carry a variety of new specialty items such as unique equestrian clothing and jewelry, hunting attire/appointments, and equestrian artwork. We also stock many new items such as riding gloves and children’s paddock boots, etc. It’s just fun to drop by and see “what’s new”….. since stock is always changing and you never know what someone will bring in! Located in downtown Ashland, Virginia, Changing Reins is at the center of Virginia Horse Country. Ashland is a great place to spend the day browsing quaint shops, lunching at great restaurants and walking streets of historic Victorian Era houses. So drop by to see us and take advantage of the substantial cost savings realized between “new” and “like new”. 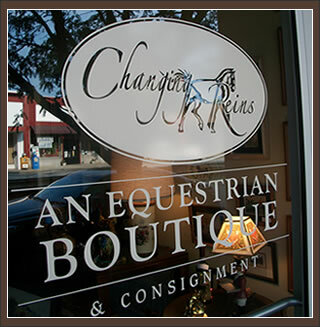 Plan a visit to Changing Reins, Inc. in Ashland soon!